A new youth sled hockey program at City National Arena provides kids with special needs the opportunity to play hockey - many for the first time. For children and teenagers with special needs, hockey, for a long time, was a sport they could watch, but not play. "It's hard to watch your kids on the side and not be able to participate in stuff," said Michelle Muscari, mother of a 15-year-old new participant. 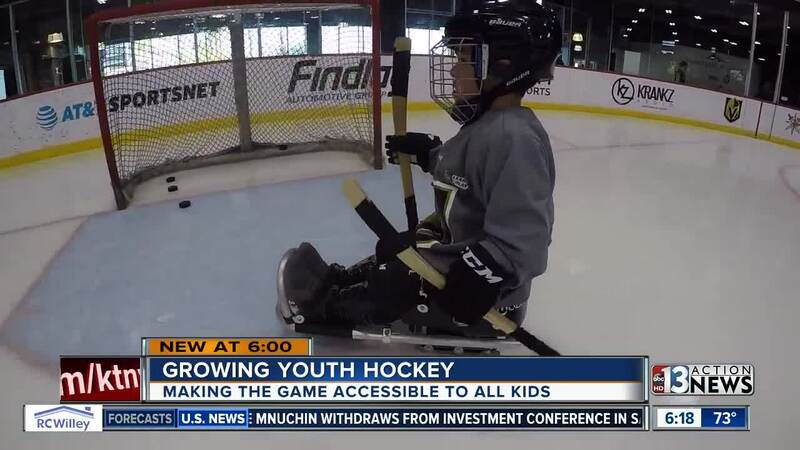 But now, thanks to a new youth sled hockey program at City National Arena, they, too, can get in the game. And learning the game starts with learning the equipment. Instead of wearing skates, players sit upright in sleds, two blades carving the ice below as they propel themselves forward with the help of dual-purpose sticks - part pick, part stick. "The first time they get into a sled, it's like taking a normal able-bodied kid to learn to the skate the first time," said Jason Griego, head coach for the sled hockey program. "They don't know how to stand up the first time. Well, it's the same time with the sled." The kids - they fall a lot. But the parents are right there, ready with an encouraging word. "I think it's just like any other kid. You have to be encouraging and just remind them they won't get better unless they get up and try and try again," Scott Chalmers, whose son is in the program. And without fail, they do try again. They're up, pushing forward and yes - scoring goals. "They want to compete, they want to practice hard and just watching their smiles, giggling and laughing. It's just normal," said Griego. What's also considered normal now - a citywide passion for hockey - wasn't just a year ago. This program was born of community support. The Vegas Golden Knights Foundation donated ice time to the Jake Kielb Hockey Foundation, which aims to grow youth hockey in Vegas. The sleds were paid for through fundraising on a VGK fan Facebook page. "We reached out and the next thing you know we had $5,000 to purchase the first sets of sleds and sticks that we're using right now," said Griego. He also said what the Golden Knights have done for youth hockey in Vegas is nothing short of amazing - giving all kids a chance to hit the ice. The program is free and parents can get their child involved here .